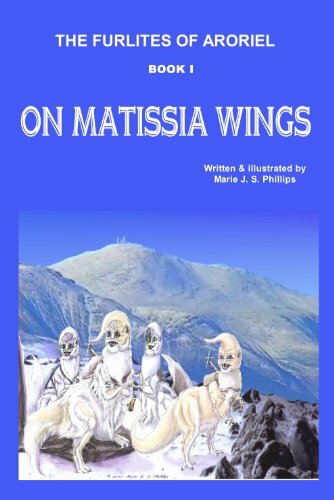 about this book: This book, THE FURLITES OF ARORIEL: BOOK I – ON MATISSIA WINGS the first book in my THE FURLITES OF ARORIEL series, follows the adventures of Clan Darius, and shows the action through members of the family, primarily Ship Commander Geupetus and his daughter, Murkuria. On their cold distant world Aroriel -- where primate species never developed -- evolution spawned his furry saurian race that now reaches for the stars. Geupetus, offered command of the first near-lightspeed starship, hesitates to take the job, as Furlitian Law forbids his pre-adolescent twins Murkuria and Thorius from accompanying their Clan on this historic mission into interstellar space. Geupetus and his Clan decide to return to the job they loved, and rocket into space aboard the Sunpyne. Distraught, Murkuria;'s twin brother, Thorius, conceives an outrageous plan to stow aboard the great starship. He and Murkuria borrow a family shuttle, and whiz off, determined to reach the Space Center before dawn launch. With the help of Iggie, Murkuria's pet Matissia, they sneak aboard the starship, inadvertently causing the Sunpyne to crash land on an alien world, where dinosaurian life like their own is long extinct, and strange primate beings that call themselves Human populate the planet. Following a violent first confrontation with two natives, they race to repair the ship. A second meeting, with a family camping out in the wilderness around the ship, results in friendship, and information exchange. However, after their Human friends leave to return to a distant home, the Human military locates the downed starship, just after they complete full repairs. Geupetus powers up the ship, but suddenly realizes his twins and one Cadet are not aboard. With enemy warcraft peppering the area with arms fire, and unable to lower shields to recover his children and crewmate, Geupetus refuses to leave without them, and he wonders if they will ever see their beloved home again? I finished the book in about two decades, because it took that long to world build and flesh out the characters. The title just came to me easily, without Iggie, the matissia character, the twins may never have succeeded in stowing away aboard the ship.. I created this cover since it shows the main character in one of the scenes in the book. I created the cover with freehand watercolor drawing, and a computer enhanced backdrop. The illustrations in the book and in the extensive glossary are all a mix of hand drawn characters and computer enhanced artwork. This book took many long years of research, organization and world building to bring it to life. The basic science must be sound in any science fiction book, even if it mixes elements of fantasy.